Motorcycle Decals and Boat Lettering Graphics. Helmet Stickers and Reflective tape/pinstriping. "Light Blaster Reflective Decals are made fresh daily"
Order Workload - please allow 3 days for production! Reflective Decals - Stickers and Lettering! 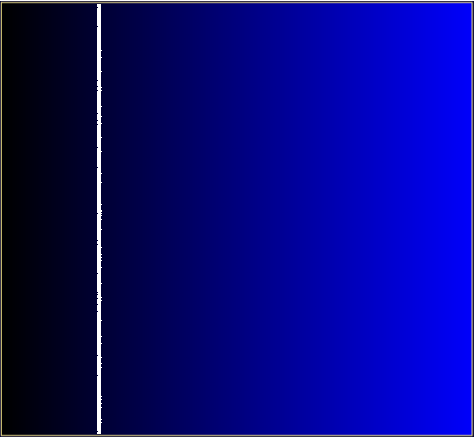 Call attention to you and your motorcycle with colors and shapes not normally seen on the highway at night. and trucks. Have a look inside! DECALS ARE NOT A REPLACEMENT FOR STOCK REFLECTORS OR LIGHTING! Stylish and confident! --It's also a life safety product that might make your more noticable at night. Buy it for it's bold and confident good looks. Made with hight quality engineer grade reflective traffic marking mateerials. Watch our EZ-INSTSALLATION VIDEO for guaranteed results! Reflective tape, also called pinstripe, adds style and safety. There's not a better printed decal. Period! Don't let an inexperienced first responder with good intentions cause additional injury trying to remove your helmet! The best looking boat lettering is a "LIFE SAVER"! that can save your life! 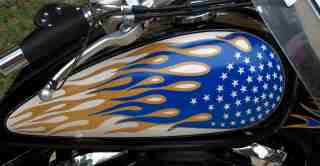 All types of motorcycle graphics and motorcycle graphics kits available. We can also design Custom Motorcycle Graphics Kits to your specification. Browse our catalog of bright motorcycle graphics kits. Shiny Black Tape that is Outrageoursly Reflective! Reflective Tape - Boat Lettering! Cool safety stickers and graphics! Streetglo - your best source for reflective motorcycle graphics, custom reflective helmet decals, reflective tape and pinstripe, reflective helmet stickers, custom motorcycle graphics, We manufacture all types of reflective motorcycle decal kits, boat lettering kits in bright and reflective Lumastripe brand vinyl - the best you can buy! We use only "engineer grade" vinyl which is generally the highest quality and most expensive vinyl available anywhere! We have all kinds of motorcycle stickers, helmet stickers, reflective tape, reflective pin stripe, and reflective boat name graphics. We also offer reflective advertising-truck lettering and vinyl signs for cars, trucks and SUV's. 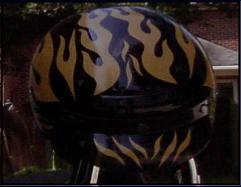 Our motorcycle decals, and reflective tape or pinstripe can be used also on boat graphics and boat lettering. 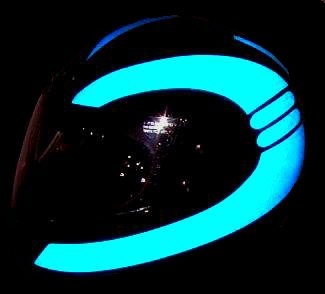 Reflective helmet decals can save a life with retro-reflective safety materials - in bright and noticeable colors. 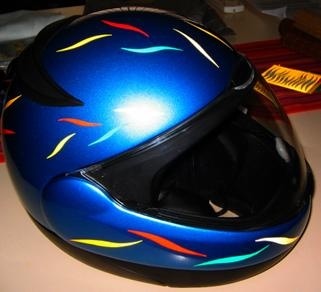 Our reflective graphics work well on motorcycles, bicycle wheels, frames and on motorcycle and bicycle helmets. We have the best line of boat graphics and boat lettering available and it is night reflective too! We also feature a custom boat decal and boat name lettering and boat graphics department online (DIY). Order your decals in bright reflective vinyl by Streetglo. 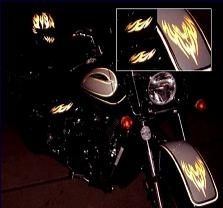 Check out our full line of reflective tape and reflective pinstripe kits for motorcycles, cars, trucks and boats. Our reflective pin striping can add sizzle to your style while helping protect you in the night Our reflective pinstripe and reflective tape is cut from the same stock as our decals so a perfect match is assured! We use only 7-8 year Engineering grade reflective vinyl for all our reflective products. 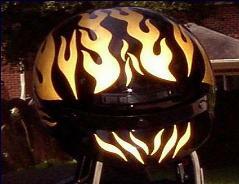 Great reflective motorcycle decals and car decals - guaranteed!. Our helmet stickers and motorcycle graphics kits, car decals and car graphics are easy to install. Just check out our decal instllation videos online. expensive doors costing thousands of dollars! All of the coolest motorcycle decals car decals and truck decals Make your statement in bright motorcycle decals / reflective decals from Streetglo Reflective Decals! Ride your bicycle safer at night with our brilliant bicycle safety reflector kit. This is no puny little decal kit, it features 72 sq. inches of night reflective safety. Quick shipping and LOW RATES. REFLECTIVE LETTERING VINYL IS MORE EFFECTIVE! If you are going to put it in writing, then why not make sure they read it! 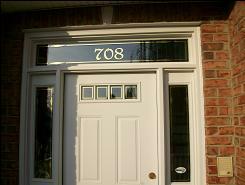 Reflective vinyl lettering is superior to ordinary lettering vinyl in more ways than one. Most importantly, our reflective vinyl lettering will command attention working even harder in the night than in daylight. No other vinyl lettering works so hard! Secondly, there is not a better grade of outdoor vinyl than our own "engineer grade" Lumastripe (tm) vinyl letters. We custom cut these letters to your exact specifications. Feel free to select one of our vinyl lettering design tools below. You can get ready-made - ready-to-install car ad truck vinyl lettering laid out on a transfer tape, or you can order DIY self adhesive lettering. You can desighn your own alphabet template such as AAaaaaBBBBbbbbCCcc, etc., or you can order just the letters you need for your project (use the General Lettering Engin after clicking DIY Vinyl Lettering link below). Not all reflective products are suitable as life safety materials. That's why we use only engineer grade ASTM D 4956 TYPE 1 Sheeting, While this material costs more than even the best premium grades, it really is the only material we are willing to use to make our safety decals. This grade of reflective vinyl is used in the most demanding types of safety marking applications. It is used for highwas signs, road blocks, police and emergency vehicles, and of course.. our decals! We take your safety seriously. That's why we used the most expensive grades of vinyl available. to the address on your invoice. contact us VIA e-mail. to obtain our return product address. OUR DIRECT E-MAIL ADDRESS IS ON YOUR E-MAIL RECEIPT SENT TO YOU AT THE TIME OF YOUR ORDER. IF YOU DID NOT RECEIVE THIS RECEIPT, PLEASE CHECK YOUR SPAM FILTER. SEND A BLANK E-MAIL TO THE ABOVE E-MAIL ADDRESS AND RECEIVE BACK AN AUTO-REPLY OF OUR COMPANY DIRECTORY AND ANSWERS TO MOSTQUESTIONS INCLUDING SHIPPING, RETURNS AND HOW TO TEST REFLECTIVE PRODUCTS! HAVE A SPECIAL ORDER OR ADDITIONAL WORK PAYMENT FOR US? Motorcycle Decals - Car Decals and more. "Streetglo stickers shine like a beacon!." "Strong metallic backed reflective material is higher quality than the more common vinyl stickers." "The boat name decal looks great! I've already recommended you to another boat owner"
"I used 1/8" black pinstripe and tape on the black parts of my Honda Shadow Aero. With 1/2" black reflective tape on the frame rails of the bike. In the daytime, you can't even see the StreetGlo pin stripes, but at night - look out! The reflective tape dramatically increased my conspicuity to the point where a cager literally squealed her tires the other night when she saw me! She had no idea what she was looking at, but she certainly knew it was bright!" "The logos that I got this week are great!" "I just wanted to thank you for your prompt service. I placed my order Monday night and an hour later, you sent me an email saying my order had been shipped. I received my decals just three days later and they are beautiful! Thank you!" Our decals, reflective tape, and other vinyl products can really dress up a motorcycle, car, truck, or boat. When you use reflective decals and or reflective tape and Pin Stripe, you add style and safety to your vehicle. We try to offer a large assortment of really cool reflective decals and vehicle & motorcycle graphics to make sure there is something for everyone. But we don't lose sight of our purpose, and that's to make the brightest and safest possible reflective products. 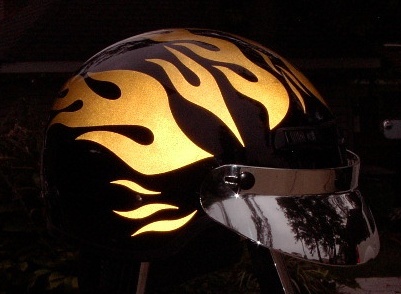 You will notice that many of our reflective helmet flame and decal kits tend to be larger and bolder. That's because bigger and bolder means more reflective surface. No matter if you are using our products for motorcycle safety, or as advertising for your business, or even just spicing up your car or truck with bright vehicle graphics, please know we appreciate the opportunity to serve you! Streetglo is your best source! SUPER BRIGHT MagicBlack reflective tape kits can be applied to any black surface, such as motorcycle frames, bicycle frames, helmets, or any other black object. Black on Black is nearly impossible to see. This tape can turn your vehicle or motorcycle frame into a super reflector and is not easily seen in ordinary daylight.